The bachelors, bachelorettes, wild animals, and rainbow recipes are all found there. This is intended to supplement her information and to answer questions that frequently come up on this forum. Villagers Returning to the Island. Post subject: Tips and Suggestions. // Scavenger Hunt Locations. - The door at hamilton's plays a role in the story line after the rainbows are completed. It is not a basement and has nothing to do with Gill or Hamilton's affections. patience young grasshopper. - Character locations: If you want to find a character, press C on the nunchuck and use the D-pad to go to the heart screen. go to the character you want to track and press A. In the bottom left corner of the screen, the character will appear with their location. - If you are trying to complete the cooking list, buy all of the dishes from On the Hook, Sundae Inn, Pineapple Inn, and the dishes at the festivals. You will get the recipes for them just by buying them and it will save you time fishing for certain fish or foraging for other ingredients. - If you are marrying someone who has a festival stall, purchase what you want from them at the festival before marrying them. After marriage, you cannot buy anything from your spouse. Decent Duck egg -> Duckonnaise; decent duck eggs sell for 150G and duckonnaise sells for 190G. There is a small scavenger hunt. The packages are small, yellow squares with red bows. The items you can find are not unique, but they are valuable and hard to come by early in the game. Lapis Lazuli is an item required in Edge's rainbow recipe. Shining Flax Yarn is an ingredient in the last rucksack upgrade as well as the Journey Rucksack. Post subject: The Quilt. // The Rainbows. before you can start making rainbow recipes, you need to collect two halves of a quilt. » after you've shipped 1000G worth of items, Hamilton will come to your house on a sunny day and tell you about the quilt. You must ship items to trigger these events, working part-time jobs does not count toward the 2000G total. » talk to Gill after you've upgraded your house to level 2. He will tell you to talk to Dale (the carpenter) who will refer you back to Hamilton. Take the key that Hamilton gives you and go to the clock tower in Waffle Town Square. You will find the right half there. There are 5 Harvest Sprites and 5 rainbow recipes to complete before you can replant the Goddess Tree. • Tuna :: fish from Waffle Town Ocean or East Gull Island during the Spring, Fall, or Winter. You will find Ben's badge on East Gull Island after you have completed Collin's rainbow. make sure that you have watered Ben's blue flower after you have completed Ben's rainbow to see his tip. After you have seen this, you will automatically pick up his badge on the far end of East Gull Island. As you try to cross Edge's rainbow, you realize that it stops in the clouds. You automatically talk to Edge who tells you that his rainbow used to lead to the top of the Goddess Tree. Follow the path up to the top of Mt. Gelato and the Harvest Goddess will visit you in a dream. She will tell you about the Seedling of Hope and where to plant it. You will find out more about it by talking to villagers. Talk to Jin and he will tell you that there is a strange seedling by the lighthouse in Waffle Town. Once you've found the Seedling of Hope? (which looks like an IUD), Jin will approach you and tell you that he couldn't find that seedling in any of his medical books. Plant the Seedling of Hope? where the old tree once stood. Talk to Calvin and he will tell you there is a mysterious seedling on the 10th floor of Ganache Mine. His research suggests that it is either the Seedling of Hope or the Midas Tree. Once you've planted the Seedling of Hope? ?, Calvin will come to the Goddess Spring and tell you more about the Midas Tree and how dangerous it was and that we are better off without it. Talk to Gill who will tell you to talk to Hamilton. Go to Sundae Inn when Hayden's Bar is open and when Hamilton is there (use the tracking feature in the menu). Talk to Hamilton and a scene will set up. Ask him about the seedling. Then ask WHAT's a secret. Then ask the next set of questions in order. The next day, go to the Church and below the alter, you'll find a key. Take the key to Hamilton's house. When he's not home, use the key to enter the door beyond the kitchen. You will find another seedling and Hamilton will catch you with the seedling and take away the key you found. Plant the Seedling of Hope!? and you will find that it does not immediately die. Return to the Goddess Spring after planting the Seedling of Hope!? and the Harvest Sprites will celebrate the planting of the new Goddess Tree. After you plant the Seedling of Hope! ?, the Goddess Tree will go through 5 growing phases. Each phase requires 10 hearts. The hearts can be from animals, pets, and villagers. Once you have 50 hearts and the tree has grown to it's final stage, a message will indicate the Mother Tree is back. You will also receive a letter from Edge about this. Go back to Edge's Tree and cross his rainbow. You will find yourself on top of the Goddess Tree and the sprites will make one final recipe that you don't have to collect any ingredients for! The Harvest Goddess will return to the island. She sends you down to Waffle Town Square where several villagers are waiting for you to congratulate you. Post subject: Tools. // Powerberries. You will get a set of standard tools at the beginning of the game as you meet residents of the island. Unlike in other Harvest Moon games, in ToT you can level up your tools independent of skill. The lighter your tools, the less stamina is used when you use them and you do not need to wait for a skill level to be able to upgrade your tools. You can upgrade them by giving Ramsey a refined ore or by purchasing an upgrade from the General Store (a General Store upgrade costs 3x more than Ramsey's upgrade). You can refine sparkling ores by talking to Mira (across from Ramsey in the blacksmith's shop) or you can buy Copper, Silver, and Gold from Julius at the Fall and Winter Festivals. Refining ores that do not sparkle will result in "scrap iron". Post subject: Crops. // Flowers. Souffle Farm sells seeds in-season. Taylor's Seeds and Pineapple Inn sells their seeds year round. Souffle Farm will gain a star after you've shipped 5000G of crop-based items. You can reach Pineapple Inn after you've completed the first rainbow. Taylor is the 6th person to move back to the island after you've completed the first rainbow. » crops grow slower when you grow them out of season. However, if you plant them a season early, they will grow like normal when their intended season comes around. » crops die 3 days after the season of their intended season passes. So Strawberries (a spring crop) will die on Fall 3. It also appears that you should not plant seeds three days within the previous season that a crop should be planted. » also, if seeds are on the ground when the season changes, they will disappear, so don't plant seeds on the 27th or 28th. Flowers grow just like crops and are available from Souffle Farm, Taylor's seeds, Pineapple Inn, and the Flower Festival. when you plant flowers, you will always get the same quality of flower no matter what soil you grow it in. however, you will sometimes see bees hovering around your flowers. when you go to pick these flowers, you will receive honey (decent), a coloured honey (depending on the colour flower), or royal jelly. I've noticed that when planted in poor or good soil, the frequency of bees increases, but the honey produced is usually decent honey or coloured honey. In great soil, the frequency of bees is less, but it's usually always royal jelly or coloured honey. the shipping prices for coloured honey and royal jelly is included in the price list. Post subject: Animals. // VIllagers Returning to the Island. You can purchase animals from Brownie Ranch after you've had Dale build the chicken coop and animal barn. You can access Brownie Ranch either after you've smashed the rock between Souffle Farm and the Brownie Ranch district with your level 3 hammer or have it automatically removed for the Animal Festival on Spring 28th. Brownie Ranch will gain a star after you've shipped 5000G worth of animal produce. » As in other HM games, you can hatch chicks and ducklings by putting an egg in the incubator in the bird coop. Chickens and ducks take one week to hatch and one week to mature. » Using a miracle potion (sold at Brownie Ranch) will impregnate a livestock. Cows will give birth after two weeks and take 4 weeks to mature. Sheep will give birth after one week and take two weeks to mature. Goats will give birth after one week and take two weeks to mature. Horses will give birth after two weeks and take 4 weeks to mature. » Ostriches can also be hatched from an ostrich egg by placing it in the incubator in the animal barn. It takes two weeks for an ostrich to hatch and 4 weeks to mature. 1. Tailor Shop - Newcomers have come to the island. They opened a tailor shop. » meet Candace as you walk past the Tailor Shop. » meet Shelly and Luna when you walk into the shop (during shop hours). Cannot trigger on the first day of the month, as they are closed on Sundays. 2. Calvin - A new comer has come to the island. He's an adventurer! Look for him deep in Ganache Mine! » meet Calvin on the 10th floor of Ganache mine, anytime. 3. Chase - A new comer has come to the island. Check the Sundae Inn. » meet Chase at the Sundae Inn during open hours. 4. Phoebe - A newcomer has come to the island. Check Ganache Mine! » meet Phoebe as you enter Ganache Mine. 5. Julius - A newcomer has come to the island. Check Ramsey the Blacksmith's. » meet Julius as you walk towards the Blacksmiths during open hours. 6. Taylor - A newcomer has come to the island. He runs a handy store! » meet Taylor will meet you at your door as you leave your house. It must be sunny and it's not always the first day that he is on the island. 7. Gray - A newcomer has come to the island. Check Brownie Ranch! » meet Gray around the Brownie Ranch barn. You cannot trigger the introduction scene on your horse or ostrich. 8. Perry - A newcomer has come to the island. Check Meringue Clinic! » meet Perry as you walk into Meringue Clinic during open hours. 9. Paolo - A newcomer has come to the island. Check On The Hook. » meet Paolo as you walk into On The Hook during open hours. The Journey Rucksack is made by the Harvest Goddess after your child has grown. After your child is fully grown, your child will ask you if you believe in fairies. If you answer "Of course!" after your spouse says that it's just a dream, then Hamilton will stop by and tell you about the tradition of the Journey Rucksack. The next day, when you talk to your child, they will tell you that they had a dream about a lady with wings who needs the child's help. When you go to the Goddess Spring, the Harvest Goddess will explain that there is another island who needs your help, but when you offer your help, the Harvest Goddess will explain that your child is the one who needs to help. When you feel your child is ready, you can return to the Goddess Spring for the list of Journey Rucksack ingredients (listed in the Rucksack. section). After you have collected the ingredients, you will receive the Journey Rucksack by taking the ingredients to the Goddess Spring. The Journey Rucksack is an item that will be stored in your own rucksack until you are ready to send your child on their own journey. Post subject: Bachelors and Bachelorettes. for each bachelor/ette, certain events will trigger at a certain number of hearts. You must complete all heart events in order for the bachelor/ette to accept your blue feather. - 2 heart event: 2 heart gift. The bachelor/ette will appear at your house on a sunny or cloudy day and give you an item. If you refuse the item, you will lose affection points. - 4 heart event: lunch date. At 4 hearts, the bachelor/ette will ask you to go to Sundae Inn for lunch (for bachelors) or Cream Beach (for bachelorettes). Talk to the bachelor/ette around 10am-11am because if you arrive to Sundae Inn or the Beach past 1pm, you will have stood them up and they will lose affection points. During the date, you will be asked a question. If you answer correctly, you will earn points whereas if you answer incorrectly, you will lose points. - 5 heart event: 5 heart gift. The bachelor/ette will appear at your house on a sunny or cloudy day and give you an item. If you refuse the item, you will lose affection points. - request event: After the bachelor/ette reaches 5 hearts, the next time you talk to them, you will be asked to meet them at a certain place or give them a certain item. You can continue to raise their affection, but they will not accept your proposal until you have completed the event. - 6 heart event: Alan's Tree date. At 6 hearts, the bachelor/ette will ask you to meet them at Alan's Tree (in Brownie Ranch district). Talk to the bachelor/ette around 10am-11am because if you arrive at Alan's tree past 1:00pm, you will have stood up the bachelor/ette and will loose affection points. During the date, the bachelor/ette will declare their love for you and you can answer that you are delighted or that you don't feel the same. If you say that you are delighted, you are not obligated to marry that individual but affections will nevertheless increase. If you answer that you cannot say the same, your affections will lower. below are a list of the loved gifts for each bachelor and where to find/how to make those gifts. Loved gift response: "Wow! This is my favorite... T-Thanks. I, uh, really love it." - 4 heart lunch date correct answer: ? - request event correct answer: "I'll find it for you!" - request event: Find his lost Diary. Once Gill has made the Request, you will find his missing Diary on the ground north of the Billboard that stands in the little square to the left of Yolanda's House. Loved gift response: "I can have it? I really like it. I might even love it. Thank you." - 4 heart lunch date correct answer: "*blush* A bit..."
- request event correct answer: ? 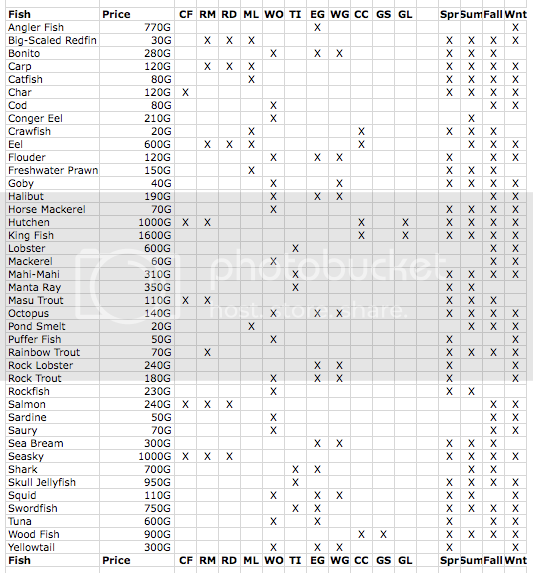 - request event: Catch a Rock Lobster. A Rock lobster can be caught during the Spring and Winter seasons and only when fishing at Gull Island, It is one of the rare items you may wish to store for future use until Toby makes his Request. Loved gift response: "Thank you for this wonderful gift! It's absolutely perfect." - 4 heart lunch date correct answer: "Yes, of course!" - request event correct answer: "You got it!" - request event: Give him Pontata Root. Loved gift response: "Wow! This is perfect! I love it! Thanks!" - 4 heart lunch date correct answer: "I'm sort of self-conscious..."
- request event: Go to the 30th Floor of the Ganache Mine when he asks you to do so. Once you have initiated the Request, it may be impossible to interact further with Owen until you have completed the task. Loved gift response: "Whoa! Are you serious? How did you know what my favorite thing is? Thanks! I really love it!" - 4 heart lunch date correct answer: "Of course!" - request event correct answer: "I refuse to lose!" - request event: Collect 20 Lumber after the Request is made. Loved gift response: "Wow, how did you know I like this? Um, thanks. I love it!" - 4 heart lunch date correct answer: "Delicious"
- request event correct answer: "Sure!" - request event: Ship 30 Cooked Dishes, then offer one to Chase after the Request is made. The Cooked Dishes you ship must be ones you have made rather than purchased at a Shop or Festival stall. Loved gift response: "Oh my, how nice! I love this! This is perfect! Thanks!" - request event: Give him a Sapphire or Ruby. Loved gift response: "This is an unexpected gift. I like it. Thanks. I"m very grateful." - 4 heart lunch date correct answer: "Yes!" - request event: Take Calvin an Apple after experiencing his Request of the 10th Floor of the Ganache Mine. Loved gift response: "Oh my! I love this! Thank you very much for this wonderful gift!" - 4 heart lunch date correct answer: "Delicious!" - request event correct answer: "Yeah, I did!" - request event: Renee asks your character to fix the windmill. This event occurs even if you are playing as a girl. Completing Daren's Rainbow restores the winds and completes this request. If you are playing as a guy, you will also receive a kiss. Loved gift response: "Wow! This is great! I love it! I just love it! Thank you!" - 4 heart lunch date correct answer: "But I wanted to try yours..."
- request event correct answer: "Okay! You got it!" - request event: She will request an Eel for Eel Rice. Loved gift response: "Wow I love it! Thank you "
- 4 heart lunch date correct answer: "Keep it coming!" - request event correct answer: "What do I get if I win?" - request event: Unlock the horse race whether you play as a boy or a girl. Win the race for a Kiss if you are a boy. Loved gift response: "How nice! I love it! Thank you! " - 4 heart lunch date correct answer: "Saltwater"
- request event: This even occurs as sooon as you visit Toucan Island and speak to Sue for the first time, whether you are laying as a boy or a girl. Complete the event by speaking to Selena, then returning to Sue. Sue will give you a Manta Ray as a reward. Loved gift response: "Wow! For me? Thank you! What a great gift!" - 4 heart lunch date correct answer: "No matter." - request event: Give her Rare Metal. Loved gift response: "Oh my, Are you sure... that I deserve something so valuable? Thank you." - 4 heart lunch date correct answer: "It's ALL good!" - request event: Give her a Snowflake Flower. Loved gift response: "What should I do...? I've never received something so nice... Thank you." - request event: Give her a Blue Mist Flower. Loved gift response: "Wow! Thanks! I love this. You're so considerate." - 4 heart lunch date correct answer: "The sweeter, the better!" - request event correct answer: "I'll grow it for you!" Rivals will marry when you are at 3 hearts with your rival and after you have triggered two rival heart events. All events can be triggered on Sunny and Cloudy days, just not on most Festival days or during typhoons or snowstorms. You will get a letter a few days after you trigger the 3 heart event informing you of the couple's wedding date. The wedding date is set rather randomly but is usually around a week later. On that day, you will automatically attend the wedding and will regain control of your character at the Church at noon. Rival Children are born one season after the rival wedding and will be at their last stage of childhood a season later. After a bachelor or bachelorette is at 8 hearts, Hamilton will come to your house on a sunny day and tell you about the blue feather tradition on the island. Some time later, it could take up to a week, an event will trigger that will show you a blue bird. Follow the bird to Caramel Falls. Follow the path past the waterfall and you will find a blue feather on the ground. You'll automatically pick it up. A bachelor/ette will accept the blue feather as soon as you have completed their request event and confession scene and have at least 8 hearts. You can still marry a bachelor/ette if you deny their love confession. Bachelor/ettes will not accept the blue feather in some areas. If they do not immediately accept and you have completed all of the requirements, try giving them the feather in different areas. » Seasky: this fish is only available in the Caramel River during a typhoon or snowstorm. » Skull Jellyfish: this fish stays at Toucan Island near where Sue fishes and is only available in the early morning hours. It is recommended that you bring a Stay Awake and stay on Toucan Island all night and start fishing at 6am. Use the Stay Awake after 6am (after you are drowsy). » Woodfish: you can only catch this fish after 8pm at the Goddess Spring. It may also require a level 3 rod. In case you cannot make it back to your house before 6am, it is recommended that you bring as Stay Awake with you. Use the Stay Awake after 6am (after you are drowsy). » you also expand your rucksack through the tailor shop. look in the "Rucksack." section for more information. » On 6 Summer, you can ask a bachelor/ette who has 3 or more hearts to watch fireworks with you. » If you do not ask your spouse to watch fireworks on 6 Summer, you will see fireworks as if you were single. » Ask any bachelor or bachelorette that has three hearts or more to the FireFly Festival on 23 Summer then be at Caramel Falls at 7pm on 24 Summer. The display ends at 10pm and you will be left alone at Caramel Falls. » After marriage, speak to your spouse the day before. If you do not ask your spouse, you will see the fireflies as if you were single. » If you do not have anyone above three hearts, you can experience the event alone. » When you first exit your house, the bachelor or bachelorette with the highest heart level, but at least three hearts, will give you a cake and a flower/farm product. » You should also give gifts. Giving cakes to bachelors and bachelorettes is appreciated (probably an affection boost). » After you are married, a Thanksgiving Festival feast is celebrated after you talk to your spouse. » Ask any bachelor or bachelorette that has three hearts or more to the Starry Night Festival on 24 Winter then be at Alan's Tree in Brownie Ranch District at 7pm on 25 Winter. The event ends at 10pm. » After marriage, speak to your spouse the day before. » If you are married, at 10pm, no matter where you are on Waffle Island, you will attend a feast at home with your spouse. » Then (whether or not you are married) a scene will show a resident of Waffle Town running along the front street between the General Store, Meringue Clinic, and the Tailor shop and Cream Beach. » You (and your spouse, if you have one) will sit at Cream Beach and watch the sunrise. If you purchase a dish or drink from a shop or during a festival, you will automatically get the recipe. That's why I have some of them. Others build off those. For all recipes that have "Fish (any)", you can get a decent, good, perfect, or shining quality, but only one recipe will ever show up on your shelf. Grilled Angler Fish - ?